The vacuum-operated stock lock actuator will be replaced by an electrical one with positional feedback. One of the nice features possible with the LINbus is that the rear wiper and washer can be prevented from operating when the tailgate is open. A neat feature is that the rear wash-wipe can delay starting for a pre-programmed period and then wipe a counted number of cycles after the washer pump stops. The counting is possible because the park-position contact will open as that position is reached. 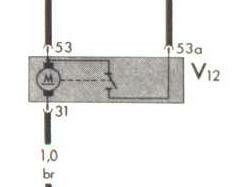 High-side FET drives is required for all wiper motor output. Low-side FET could operate the demister heater and the number plate lights but some people are “disturbed” by having such devices floating at 12V. The lock actuator is driven by an H-bridge. The actuator draws just over 6A when stalled at the limit. No fuse will be used for nominal output protection as the FET drives provide feedback to detect short circuit and open circuit; along with current-limiting. 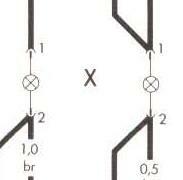 As the high-level brake light operates 3 bulbs in parallel, a filament failure is more difficult to detect. The actual current has to be measured as does the circuit for the two lights for the number plate. Care has to be taken to minimise current draw with the engine off and parking lights on as this also requires the number plate to be illuminated, which cannot be done simply while the node goes to sleep. It must remain “awake”, along with the other lighting-related nodes. The maximum current load in the tailgate can be managed. The heating element of the demister can be safely switched off temporarily while the wiper is actually running as that motor only operates intermittently. That nearly halves the required peak current capacity of the wiring into the tailgate..
For flexibility to be accommodated when opening and closing the tailgate, and managed current carrying capacity, the supply and chassis common wires should each be two 1mm2 with a single 2.5mm2 wire for the power harness on the fixed part of the car, up to the fused junction box.